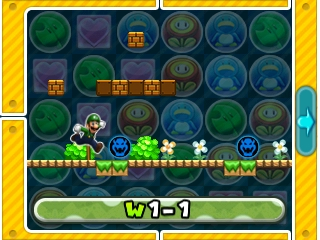 Luigi traversing through World 1-1 on the Map screen. When entering a course in Puzzle & Dragons: Super Mario Bros. Edition, the player can see a cut-out of Mario or Luigi traversing from one point to the next on the touch screen, such points consisting of regular battles (blue Bowser icons), ? Blocks, branching paths and boss battles (large Bowser icons). By pressing during the player's turn, they can view their current position as well as the stop ahead of them. This page lists the layout of each course. For the Special Worlds, only courses that have different Orb requirements for branching paths than their normal world counterparts are included. A battle. The player clears this if they successfully defeat all enemies in a battle. A ? Block. Requires the player to clear a certain amount of Orbs, make a certain amount of combos, and/or to arrange Orbs horizontally or vertically. Succeeding in satisfying any conditions required of the player opens the ? Block for them, rewarding them items. Signs. When reaching a branching path, the player can continue on the main path by clearing a certain amount of Orbs over others at Warp Pipes. The first sign is for continuing the path on the left; the second sign is for continuing the path on the right; the tall twin signs are for continuing straight ahead. Warp Pipes. Entering one requires the player to clear more Orbs of its matching color than others. At the end of another area, the player automatically takes a Warp Pipe back to the main path. Exit Warp Pipes. The player comes out of one from the main area. If there are any battle icons next to exit Warp pipes, the player skips it if they came out from another area. A Beanstalk inside a Gold Block. Unlike signs and Warp Pipes, they do not show which Orb color is needed to trigger it. Triggering one sprouts its Beanstalk, allowing the player to access another area. For the map of this course's Special World counterpart, see here. Taking the yellow Warp Pipe down requires an ally that can create Light Orbs. Third battle contains a Coin Coffer. Third battle after taking the green Warp Pipe down contains a Coin Coffer. Taking the purple Warp Pipe down requires an ally that can create Dark Orbs. First battle after taking the yellow Warp Pipe down contains a Coin Coffer. Fourth battle after taking the yellow Warp Pipe down contains a Coin Coffer. Third battle after taking the red Warp Pipe down contains a Red Coin Coffer. Hitting the Gold Block and climbing up the beanstalk requires an ally that can create Dark Orbs. A Coin Coffer appears in the first battle after. Third battle after taking the yellow Warp Pipe down contains a Coin Coffer. Second battle after taking the blue Warp Pipe down contains a Coin Coffer. Hitting the Gold Block and climbing up the beanstalk requires an ally that can create Dark Orbs. Third battle and boss battle contain Coin Coffers. In ★5-4, the player faces a King Yellow Coin Coffer for the boss battle. First battle after climbing the beanstalk contains a Coin Coffer. Second battle after taking the green Warp Pipe down contains a Coin Coffer. Hitting the Gold Block and climbing up the beanstalk requires an ally that can create Water Orbs. If the player takes the green Warp Pipe and has Water Orbs to take the next path, the battle contains a Coin Coffer. A Coin Coffer can be found in the third battle and the first battle after taking the red Warp Pipe down. Fourth battle after taking the green Warp Pipe down contains a Coin Coffer. Hitting the Gold Block and climbing up the beanstalk requires an ally that can create Wood Orbs. The second battle contains a King Coin Coffer. If the player takes the green Warp Pipe down then takes the path using Wood Orbs, the battle thereafter contains a King Coin Coffer. Taking the green Warp Pipe down requires an ally that can create Wood Orbs. In ★7-8, the player faces three Coin Coffers in the third battle and a King Purple Coin Coffer (and occasionally a second King Coin Coffer) for the boss battle. After climbing the beanstalk by clearing more Wood Orbs, the player encounters a King Coin Coffer on the second battle, and a Coin Coffer on the third. First battle after taking the yellow Warp Pipe down contains a King Coin Coffer. Hitting the Gold Block and climbing up the beanstalk requires an ally that can create Light Orbs. First battle after taking the blue Warp Pipe down contains a Coin Coffer. Hitting the Gold Block at the first branching path and climbing up the beanstalk requires an ally that can create Dark Orbs. The second battle contains a King Coin Coffer, and a Coin Coffer for the third. First battle after taking the purple Warp Pipe down contains a Coin Coffer, and the second battle, a King Coin Coffer. Hitting the Gold Block at the first branching path and climbing up the beanstalk requires an ally that can create Water Orbs. The player encounters a Coin Coffer on the third battle, as well as any second battles after taking the path or climbing the beanstalk. For the map of this course's normal world counterpart, see here. First battle after taking the purple Warp Pipe down contains a Coin Coffer. Hitting the Gold Block and climbing up the beanstalk requires an ally that can create Light Orbs. A Coin Coffer appears in the second battle after. Third battle after taking the purple Warp Pipe down contains a Coin Coffer. Hitting the Gold Block and climbing up the beanstalk requires an ally that can create Dark Orbs. If the player takes the green Warp Pipe and has Water Orbs to take the next path, the battle contains a Coin Coffer. Hitting the Gold Block and climbing up the beanstalk requires an ally that can create Water Orbs. The second battle contains a King Coin Coffer. After climbing the beanstalk by clearing more Fire Orbs, the player encounters a King Coin Coffer on the second battle, and a Coin Coffer on the third. First battle after taking the yellow Warp Pipe down may contain a Coin Coffer. Third battle contains three Coin Coffers. First battle after taking the green Warp Pipe down contains a Coin Coffer, and the second battle, a King Coin Coffer. Hitting the Gold Block at the first branching path and climbing up the beanstalk requires an ally that can create Light Orbs. This page was last edited on April 20, 2018, at 01:13.